This Post-Workout Protein Shake is Like Banana Bread In A Glass! Banana bread in a shake anyone?! 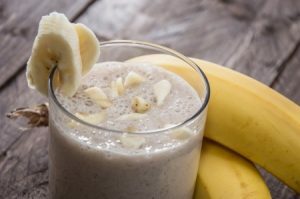 If you’ve got a sweet tooth but don’t want to compromise on your health goals, make this banana bread protein shake your post-workout treat! Naturally sweetened with banana and cinnamon, this shake will satisfy your cravings while helping your tired body to refuel and recover. Bananas are also great to prevent muscle cramps, protect your heart, improve your digestion and help you lose weight more easily. Cinnamon is traditionally used because of its numerous health benefits. It’ll give your metabolism a boost, reduce inflammation, stabilise your blood sugar levels and help to protect you from cancer. For the true banana bread taste, don’t forget the walnuts! These brain-shaped nuts are rich in omega-3’s and antioxidants and have been shown to improve your memory, protect your heart and reduce the risk of developing various cancers. This shake is also full of protein, that’ll help you to recover from a hard workout, regulate your appetite and keep your stomach satisfied for longer. Almond milk is a great non-dairy substitute that’s low in calories, high in healthy fats and contains calcium and vitamin D to keep your bones strong and healthy. While this shake contains a perfect mix of carbohydrates, protein and fats for optimal post-workout recovery, it also makes a great on-the-go breakfast or a diet-friendly afternoon treat!